Who am I and why am I here? Why Prints Charming & Purse and Boots? Witness the clumsy dance of the colours and patterns of life, the sometimes-harmonic, sometimes-cacophonic combination of the silence and the noise all around, and the heroes and the helpless within. Welcome to my little corner of The Mighty Interwebs, where it is not likely you will find anything profound (or even very interesting), but where you will find all manner of random. Life is a kaleidoscope of the weird and the wonderful, the awesome and the awful, the blessings and the bizarre, and the collision between them is what you just might stumble upon here if you stick around. Grab your favorite drink and come hang out with me if you dare. For those who like a nice fresh salad with their soup! In small saucepan, bring cream, butter, and sugar to a boil. Remove from heat, stir in chopped chocolate so that it melts completely. Stir in raspberry liqueur. Let ganache cool to room temperature. Gently combine raspberries, hazelnuts, mint, small pinch of salt, and raspberry liqueur. In wide, shallow soup bowl, pour about 3 ounces of room temperature ganache to fill shallow pool in the bottom of the bowl, about 1/8" deep. Place a nice spoonful of raspberry/hazelnut salad in centre, garnish with a small spoonful of whipped cream and shaved bittersweet chocolate. Top with chopped hazelnuts, if desired. 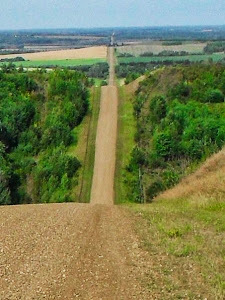 Up one hill, down another; through woods, beside creeks, under the vast blue sky ... Over the years, I've been on several roads. All of them lead back home. The adventures I've had, the people I've met, the dreams I've realized are parts of what have made this my road. Some stories are written here, in the margins of the map of my life's road. Others are carried deep within me. All have helped me become the person I am.